Posted on Thu, Apr 12, 2012 : 5 a.m.
Studs Terkel, a Pulitzer Prize-winning author and broadcaster, said, "Once you become active in something, something happens to you. You get excited and suddenly you realize you count." At the bridge table, you can count as a defender by being either active or passive, the subject for this week's columns. Look at the North and East hands. 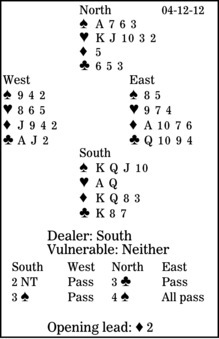 Against four spades, West leads the diamond two. How should East plan the defense? The dummy is very threatening. That heart suit is surely ready to provide declarer with discards. East must defend actively by taking the first trick and shifting to the club 10, here giving the defense the first four tricks. Then East should congratulate his partner on the opening lead. If West had chosen, say, a trump, declarer would have taken at least 11 tricks. He would have drawn trumps and run the hearts, discarding all of his clubs. Then he would have led dummy's singleton diamond. Note that East would have to play low to hold South to 11 tricks. If East nervously grabbed his ace, declarer would get two overtricks.